BOM isn’t a very creative or inspiring name for a program that is full of opportunities to learn new techniques, experiment with colours and build your quilting skills. It is, however, self-explanatory. Each month, members have the opportunity to pick up a pattern for a quilt block to take home and sew on their own. The block will include a picture of the block, suggestions on fabric selection and cutting and piecing instructions. There are many different ways to run the BOM program. For example, throughout the year there may be a theme common to all the patterns (e.g., all applique, all using half square triangles). Sometimes the blocks have a theme so when the member completes all the blocks during the year there is cohesion for a quilt design (e.g., a common colour scheme, the blocks are all stars). Some years the BOM program is based on a theme and the final product is a row quilt with a theme such as “summer at the cottage” or “my Canada” or “winter holiday”. Another option is that the guild can charge a fee for the fabric or the patterns and rebate the cost if you return the block the next month that can be used for a member draw or for the guild charity program. The most exciting part of the BOM of the program is to see at the end of the year or at the next quilt show, the quilts that members create. The techniques, colours, layouts and personal touches that each quilter brings to his/her quilt combine for an incredible visual experience. The Mississauga Quilters Guild respects and supports of the work of talented quilt designers. The BOM program acknowledges and credits the source for each BOM and seeks copyright approval. See our Copyright page for a fuller discussion on Copyright. This year we will be doing a row by row quilt pattern designed by Kimberly Einmo and published in AQS Magazine in 2016. It’s very stash friendly. The finished quilt is 76" by 88" and uses yardage for the background and 18-20 fat quarters. The block for September is Row 2 “Fancy Chain” and requires 6 blocks at 10” finished. Click here for the directions for this block, yardage requirements and a look at the finished quilt top. Need some more inspiration? Check out Kimberly’s show and tell website. This month is Row 3 and made up of two blocks – Friendship Star and Turn Dash. The blocks measure 6.5” unfinished and the row has 10 blocks – 5 of each. Click here for the instructions. Although Row 6 is also in this set of instructions, we are only making Row 3 in November. There is no row in December, but as a bonus, if you are interested in a holiday project check out this Christmas Star quilt pattern by Zen Chic pattern designer Brigitte Heitland. Row 5 - Maple Leaf make 3 10.5" blocks, Tulip 3 10.5"
This year's Block of the Month will be a Medallion based quilt. Make a 12 ½” block (unfinished) of your choice or you can choose the size of the block. The block can be pieced, appliqued, traditional or modern, or a combination of techniques. You could even use a panel or large print. 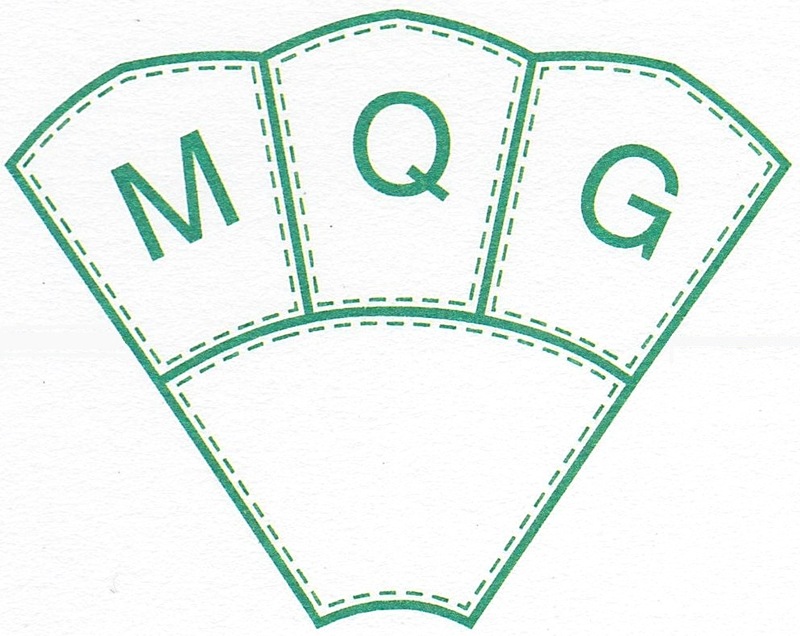 This will be the focus point of your quilt and the first building block of the quilt. Pick up the instructions at the September members’ meeting. $2.00 for photo copying. Border 3 – Add another border / borders to the quilt in the same way that frames were sewn around the centre quilt block. I am going to make my borders the same to keep the continuity going in the quilt. We are adding a 4th border of blocks. Mine are 3” (3½" unfinished) and I made 52 pinwheels. You can make yours any size to accommodate your quilt​. It’s time for border #5. Add the border in the same way that frames were sewn around the centre quilt block. I am going to make my borders the same to keep the continuity going in the quilt. This month we are going to elongate our quilt from a square to a rectangle. Add any number of combination of one or more borders to the top and bottom of the quilt top. Try and keep them symmetrical. Measurements for mine totaled 10” per border per side. My quilt now measures 52 x 72.5. If you chose to keep your quilt square, just add the same border all the way around. Don’t forget that the borders can be comprised of block or fabric…your quilt, your way! This year we are planning a different Block-of-the-Month project - a mystery quilt. I know, I know… you don't like mystery quilts. I never did either. Choosing colours can be challenging when you have no idea how it will turn out. This project is actually the first mystery quilt I have ever done and I received permission for our guild to use it from the authors who were at a quilting retreat in Northern Michigan. The sewing is straightforward, choosing fabrics is not stressful, the steps are manageable and it finishes as a lovely quilt. Trust us! Fabric requirements will be given out at the September meeting. If you wish to sign up for the directions, there will be a $2.00 charge for photocopying costs. ​Linda and Mary were absolutely delighted to seeing your finished quilt tops and quilts from our block of the month project from last year. Sharing our creative work helps inspire others when they see what others are doing. See the results below. Our website manager is awaiting some of our members to notify her so that your name can be matched with the images of your quilt taken at our September meeting. Techniques: machine pieced, hand pieced, hand appliqued, machine appliqued and hand embroidered, machine quilted. Quilted by Irene Brayne in the Maple Syrup Pattern. An image of the back of this quilt is shown below. Inspiration: "In 1967 I became a Canadian Citizen which involved swearing allegiance to the Queen in a Notary Pubic's office. What a letdown for my Canadian Centennial project! Years later I took my girl guide troop to Citizenship Court to serve cookies and juice to the new Canadian Citizens. Judge Barcbaralli presided with a big flag behind him and a Mountie on either side of him. Everyone received a Canada pin (a paper flag these days). So, I made the back of this quilt my version of juice and cookie, flag, and Mounties. i have visited every province. I tried Newfoundland for the third time in June but the daytime high temperature was 6 degrees C. The borders are the capitals of the Provinces and the hockey and lacrosse sticks represent Canada's official winter and summer games. This is my Party for Canada's 150th birthday." As you have probably guessed by now, Mary and I have changed up the Block of the Month program again this year. We know you all have lots and lots of fabric that needs to be used up. Our goal is to help you do that. Each month we are going to provide you with a hand-out. Each hand-out will provide you with ideas on how to use a specific pre-cut (charm squares, jelly rolls or strips, etc.) or a particular shape of fabric (triangles, hexagons, etc.) The first month we did squares. We will have the next handout ready at the October meeting as well as a couple of samples of the quilts for you to see. Month One was a freebie. If you wish to continue with the program, you MUST sign up. The cost is $6.00 for the ENTIRE program. This covers the cost of the photocopying. At the end of the year, you will have a nice collection of fast and easy ideas to use up your stash. BUT – we expect you to do some work. There will be a prize at the end of the program in June. 2013 - 2014 BOM from Elaine T.
See the fabulous results of our Block of the Month! Click on the link below for the photos taken at the June meeting. I also have tutorials on my blog –below are the links to the tutorials.